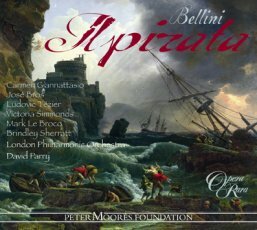 Vincenzo Bellini’s third opera, Il pirata, marked an important step in his career. Not only was it the 27 year old’s first score for the brand leader of Italian opera houses, La Scala, Milan, it also represented his first collaboration with Felice Romani, the leading librettist of the day, who was to become his regular artistic partner. Based (via a French translation) on an English play by the Anglo-Irish Gothic writer Charles Maturin, Il pirata describes how Gualtiero (José Bros) is shipwrecked during a storm on the Sicilian coast, where his former love, Imogene, (Carmen Giannattasio) has been forced into an unwilling marriage by Ernesto, the local duke (Ludovic Tézier). Tensions build between the three until Gualtiero kills Ernesto in a duel, causing Imogene to go mad with guilt. David Parry conducts this exceptional example of early romantic opera at its most dramatically potent. The 3CD set comes with Opera Rara’s usual exemplary packaging; its beautifully illustrated book includes a complete libretto with an English translation by Jeremy Commons and comprehensive article and synopsis by Dr Benjamin Walton. The opera opens on a stormy Sicilian seashore, near the castle of Caldora; a ruined monastery can be glimpsed in the distance. As the tempest rages, fishermen and women gather to try to help a ship in distress. The hermit Goffredo, now the monastery’s sole resident, calls them to prayer, and shortly afterwards a skiff manages to reach the ship and rescues its crew. Those still on shore head for the castle to ask the Duchess Imogene for her hospitality towards the new arrivals. The rescued sailors include Gualtiero, the former Count of Montaldo, who had been outlawed from Sicily ten years earlier after losing in battle to Ernesto, Duke of Caldora. In his absence, Ernesto has married and had a son by Imogene, Gualtiero’s former beloved; Gualtiero, meanwhile, has taken up as leader of a band of Aragonese pirates, and remains bent on revenge. The rescued ship is the pirates’ only surviving vessel, following a further defeat at the hands of Ernesto that now leads Gualtiero back to the land of his youth, and into his enemy’s territory. Goffredo, who in happier times had served as Gualtiero’s tutor, quickly recognizes his former pupil, and they greet each other joyfully. But the mood soon darkens, as Gualtiero dwells on his continued hatred of Ernesto, and his equally unshakable love for Imogene. The fishermen return with news that the Duchess is on the way to visit the survivors. Keen to keep from Gualtiero the identity of Ernesto’s wife, Goffredo bids him to take refuge in his hermit’s cell. Imogene then enters, accompanied by her lady-in-waiting Adele, and asks Gualtiero’s companion Itulbo for details of his wrecked ship. She is also keen to hear of recent encounters with pirates, and particularly eager for news of the pirates’ leader. Itulbo responds evasively, and his suggestion that this leader may be dead upsets Imogene, leading her to recount to Adele a dream where she had seen Gualtiero wounded on a deserted shore. It is at this moment that Gualtiero emerges and sees Imogene; she hears (and half-recognizes) his cry, and wants to investigate further, but is persuaded to return to the castle, having extended invitations to all the survivors. At the castle that night, the pirates carouse. Itulbo seeks to restrain their entertainments, in order to conceal their piratical qualities. Imogene sends Adele to tell Gualtiero of the duchess’s wish to see him; he enters, wrapped in his mantle. She offers him financial assistance, which he refuses; both confess the sorrow of their lives. It is only when she starts to leave, however, that Gualtiero discloses his identity. They embrace, but Imogene then reveals her marriage to Ernesto, unwillingly undertaken to save her father from death in prison. Gualtiero is horrified, not least by the realization that all his hopes during his years of exile have been built on nothing. So great is his anger that when Imogene’s young son enters he reaches for his dagger; her cry leads him instead to embrace the child, before rushing out. A distant military band proclaims the unexpected return of Ernesto from battle; Adele informs Imogene that the Duke awaits her. The scene changes to the illuminated exterior of the castle, where soldiers and Duke celebrate their victories over the pirates. Ernesto is disappointed to see Imogene so downcast. She pleads illness, and he promises to devote more time to her now that the threat from Gualtiero’s men has receded. Ernesto asks if she knows anything about the shipwrecked sailors, and calls for their leader to come before him. The pirates enter, and Itulbo steps forward as their leader in place of Gualtiero, who stays concealed within the group. Ernesto initially declares that all of them will remain as prisoners in Caldora until their names and intentions can be ascertained. Imogene then appeals for clemency, and Ernesto agrees to let them leave the next day. All the pirates kneel before Imogene in thanks, and Gualtiero uses the opportunity to speak to her again, hidden from Ernesto by the hermit and Itulbo, to ask for a further meeting. She resists, and in response he calls for revenge. Imogene then faints, and as she comes round all the characters express their conflicting thoughts and emotions: torment from Imogene, worry from Adele, suspicion from Ernesto, rage from Gualtiero, and from Itulbo and the hermit the desperate desire to escape. As the act closes, Gualtiero is led away by his friends; Imogene is taken off by her ladies in waiting. Ernesto is left on stage with his knights, deep in thought. Late that night, outside Imogene’s rooms, her attendants seek information from Adele about the Duchess’s health, and pray that she can find peace. As dawn breaks, Adele tries to convince her to see Gualtiero, since otherwise he will not leave. They are interrupted by Ernesto, who accuses his wife of feigning illness while pining for her former lover. Imogene reminds Ernesto that he knew of her continued feelings for Gualtiero when he married her, and that they remain unchanged, although she lives without hope, and she looks forward to the end of her life. A knight brings news of Gualtiero’s presence in the area, which incites Ernesto to a furious call for the deaths of both his enemy and his wife. The scene changes to a loggia in the castle, where Itulbo expresses disquiet over Gualtiero’s plan to keep all his men in place to prepare for action, dependent on the outcome of his encounter with Imogene. With the stakes now clear, Imogene and Gualtiero meet once more. Gualtiero says that either she should come with him, or he will fight Ernesto to the death. He tries to tempt her with the pleasures of a life over the sea, but Imogene stands firm, and calls on Gualtiero to show forgiveness. She then tries to depart, but he prevents her. At the same time, Ernesto arrives to spy on their conversation, before stepping forward to interrupt their farewells. The two men turn on each other, thirsting for blood, and as they leave to do battle it is Imogene who finds herself alone, again calling for her own death; she faints, and when she comes round she can think of nothing but stopping the fight. Knights and Ladies of the castle gather on the ground floor of the castle, which provides a view to a waterfall beyond. Ernesto has been killed by Gualtiero, and his soldiers bring his weapons in the form of a trophy. They call for revenge on Gualtiero, and are astonished when he enters the hall. He offers his own life in return for the free passage of his men. Ernesto’s men call for the Council of Knights to put him on trial, and Gualtiero asks Adele to tell her lady that he hopes for her compassion. As he heads to the Council, the chorus is struck by his courage, despite his crime; Gualtiero hopes that he will be remembered for his tormented life as well as for his ruthless actions. Imogene enters with her son, having lost her mind. She imagines Ernesto calling for their child, and asks him to seek his father’s pity. With the news that Gualtiero has been condemned, she calls for him to be set free. Instead, she sees the scaffold that has been erected for him, and as her ladies in waiting try to lead her away she imagines his death and runs off. The Knights lead in Gualtiero, who asks only for a quick end; but before his wish can be granted, the pirates attack. Imogene and Adele enter again, to see Gualtiero and his men traversing the bridge out of the castle, over the waterfall. Gualtiero then kills himself; Imogene loses consciousness once more, and the opera ends with a tableau of collective dismay and horror. An der Küste in der Nähe der Burg Caldora auf Sizilien tobt ein Sturm. In der Ferne sieht man ein verfallenes Kloster. Fischer und ihre Frauen versammeln sich am Strand, um einem in Seenot geratenen Schiff beizustehen. Der Einsiedler Goffredo, mittlerweile der einzige noch im Kloster lebende Mönch, fordert sie auf zu beten, und wenig später gelingt es einem Ruderboot, sich zum Schiff vorzukämpfen und die Besatzung zu retten. Die Menschen, die noch am Ufer stehen, brechen zur Burg auf, um die Herzogin Imogene zu bitten, den Schiffbrüchigen Gastfreundschaft zu gewähren. Zu den geretteten Seeleuten gehört auch Gualtiero, der ehemalige Graf von Montalto der vor zehn Jahren den Kampf gegen Ernesto, den Herzog von Caldora, verlor und deswegen aus Sizilien verbannt wurde. In der Zwischenzeit hat Ernesto Imogene, Gualtieros damalige Liebste, geheiratet und einen Sohn mit ihr bekommen. Gualtiero seinerseits, mittlerweile Anführer einer Gruppe aragonischer Piraten, sinnt nach wie vor auf Rache. Das gerettete Schiff ist das einzige, das den Piraten noch geblieben ist; sie haben gegen Ernesto eine weitere Niederlage erlitten, die Gualtiero jetzt in seine Heimat und auf das Territorium seines Widersachers führt. Goffredo, der in besseren Zeiten Gualtiero als Lehrer unterrichtete, erkennt seinen einstigen Schüler sofort, überglücklich begrüßen sich die beiden Männer. Doch rasch schlägt die Stimmung um, Gualtiero spricht von seinem wilden Hass auf Ernesto und seiner ebenso unvergänglichen Liebe zu Imogene. Die Fischer kehren zurück mit der Nachricht, die Herzogin sei auf dem Weg, die Schiffbrüchigen zu begrüßen. Goffredo möchte Gualtiero die Identität von Ernestos Gemahlin verheimlichen und bietet ihm Zuflucht in seiner Einsiedelei an. Dann erscheint Imogene in Begleitung ihrer Zofe Adele und fragt Gualtieros Begleiter Itulbo nach Einzelheiten über das in Seenot geratene Schiff. Zudem erkundigt sie sich angelegentlich nach Piraten, denen er in letzter Zeit begegnet sei, und insbesondere nach deren Anführer. Itulbo antwortet ausweichend, seine Mutmaßung, der Anführer könnte tot sein, verstört Imogene so sehr, dass sie Adele von einem Traum erzählt, in dem sie Gualtiero verwundet an einem einsamen Strand liegen sah. In eben diesem Augenblick erscheint Gualtiero und sieht Imogene, sie hört seinen Aufschrei, erkennt halb, wer ihn ausgestoßen hat, und möchte dem nachgehen, wird aber überredet, in die Burg zurückzukehren, in der sie zuvor allen Schiffbrüchigen Herberge angeboten hat. Abends in der Burg sitzen die Piraten beim Zechgelage. Itulbo versucht sie zu mäßigen, damit sie nicht ihre wahre Identität verraten. Imogene schickt Adele zu ihnen mit dem Auftrag, Gualtiero zu bestellen, die Herzogin wünsche ihn zu sehen. Er tritt vor sie, hat sich aber in einen Umhang gehüllt. Sie bietet ihm finanzielle Hilfe an, die er ablehnt, beide beklagen ihr unglückliches Los. Erst als Imogene sich zum Gehen wendet, gibt Gualtiero sich zu erkennen. Sie umarmen sich, dann erzählt Imogene von ihrer Vermählung mit Ernesto, die sie nur gezwungenermaßen einging, um ihren Vater vor dem Tod im Kerker zu bewahren. Gualtiero ist entsetzt, nicht zuletzt ob der Erkenntnis, dass all seine Hoffnungen, die er die ganzen Jahre im Exil hegte, auf Sand gebaut waren. So groß ist sein Zorn, dass er zum Dolch greift, als Imogenes kleiner Sohn eintritt, ihr Aufschrei jedoch bringt ihn zur Besinnung, er schließt das Kind in die Arme, ehe er hinausstürzt. In der Ferne verkündet eine Militärkapelle die überraschende Rückkehr Ernestos aus der Schlacht. Adele überbringt Imogene die Nachricht, dass der Herzog sie erwartet. Die folgende Szene spielt sich auf dem erleuchteten Platz vor der Burg ab, wo der Herzog im Kreis seiner Soldaten seinen Sieg über die Piraten feiert. Enttäuscht muss er feststellen, dass Imogene sehr bedrückt ist. Als Entschuldigung führt sie an, dass sie sich krank fühle, und er verspricht, ihr jetzt, nachdem Gualtieros Männer keine Bedrohung mehr darstellen, mehr Zeit zu widmen. Dann fragt er sie nach näheren Auskünften über die schiffbrüchigen Seeleute und verlangt, dass deren Anführer vor ihn trete. Die Piraten erscheinen, Itulbo gibt sich an Gualtieros Statt als Anführer aus; dieser verbirgt sich inmitten seiner Männer. Zunächst befiehlt Ernesto, dass sie alle als Gefangene in Caldora bleiben, bis ihre Namen und ihre Absichten bekannt seien, aber als Imogene für sie um Gnade bittet, willigt der Herzog ein, sie am kommenden Tag ziehen zu lassen. Dankbar sinken die Piraten vor Imogene in die Knie, und Gualtiero nutzt die Gelegenheit, um noch einmal mit ihr zu sprechen. Durch Goffredo und Italbo vor Ernesto verborgen, bittet er sie um eine weitere Zusammenkunft. Das Ansinnen lehnt sie ab, woraufhin er nach Rache verlangt. Imogene fällt in Ohnmacht, als sie wieder zu sich kommt, verleihen alle Anwesenden ihren widerstreitenden Gedanken und Gefühlen Ausdruck: Imogene Seelenqual, Adele Sorge, Ernesto Misstrauen, Gualtiero Wut und Itulbo und Goffredo den Wunsch, baldmöglichst aus der Burg zu fliehen. Der Akt endet, als Gualtiero von seinen Freunden und Imogene von ihren Damen fortgeführt werden. In Gedanken versunken bleibt Ernesto mit seinen Männern auf der Bühne zurück. Spät in der Nacht erkundigen sich Imogenes Zofen bei Adele nach dem Befinden der Herzogin und beten, sie möge Frieden finden. Im ersten Morgengrauen versucht Adele, ihre Herrin zu überreden, Gualtiero zu empfangen, da er sonst nicht gehen werde. In dem Moment werden sie von Ernesto unterbrochen, der seiner Frau Vorhaltungen macht, sich als krank auszugeben, während sie sich in Wahrheit nach ihrem früheren Geliebten verzehre. Imogene erinnert ihn daran, dass er schon vor der Vermählung von ihren Gefühlen für Gualtiero gewusst habe und diese sich nicht verändert hätten, obwohl sie ohne jede Hoffnung sei und das Ende ihres Lebens herbeisehne. Ein Ritter kommt mit der Nachricht, Gualtiero sei in der Gegend gesehen worden, woraufhin Ernesto wütend den Tod seines Feindes und seiner Frau verlangt. Die Kulisse verlagert sich zu einer Loggia in der Burg. Itulbo äußert seine Besorgnis wegen Gualtieros Plänen, all seine Männer müssten kampfbereit Stellung beziehen, um abhängig vom Ausgang seines Gesprächs mit Imogene angreifen zu können. Als das Treffen stattfindet, fordert Gualtiero sie auf, mit ihm mitzukommen, sonst werde er Ernesto auf den Tod bekämpfen. In verlockenden Tönen schildert er ihr die Freuden des Lebens auf dem Meer, doch Imogene lehnt beharrlich ab und bittet Gualtiero ihrerseits, Vergebung zu üben. Als sie sich zum Gehen wendet, hindert er sie daran, und in dem Augenblick erscheint Ernesto. Zwar ist er gekommen, um ihr Gespräch zu belauschen, doch nun tritt er vor und unterbricht ihr Abschiednehmen. Blutdurstig greifen die beiden Männer zu den Waffen und gehen zum Zweikampf davon, Imogene bleibt allein zurück und wiederholt ihren Wunsch zu sterben. Sie fällt in Ohnmacht, und als sie wieder zu sich kommt, hat sie nichts anderes im Sinn, als den Kampf der Männer zu beenden. Die Ritter und die Burgdamen versammeln sich im Erdgeschoss der Burg, im Hintergrund ist ein Wasserfall zu sehen. Ernesto ist von Gualtiero getötet worden, seine Soldaten tragen seine Waffen in Form einer Trophäe herein. Sie fordern Rache an Gualtiero und sind erstaunt, als er tatsächlich den Saal betritt. Er bietet sein eigenes Leben im Gegenzug dafür, dass seine Leute unbehelligt ziehen dürfen. Ernestos Männer fordern, dass ein aus Rittern bestehender Rat ihm den Prozess mache, Gualtiero bittet Adele, ihrer Herrin auszurichten, er hoffe auf ihre Gnade. Als er aufbricht, um sich dem Rat zu stellen, ist der Chor beeindruckt von seinem Mut, all seiner Verbrechen zum Trotz. Gualtiero hofft, dass man seiner nicht nur wegen seiner ruchlosen Taten gedenke, sondern auch wegen seines unglücklichen Lebens. Imogene tritt mit ihrem Sohn auf, sie hat den Verstand verloren. Sie glaubt, Ernesto rufe nach seinem Sohn, und rät ihm, seinen Vater um Erbarmen zu bitten. Auf die Nachricht, Gualtiero sei verurteilt worden, verlangt sie, er solle freigesetzt werden. Doch sie erblickt nur den Galgen, der für ihn errichtet wurde, und als ihre Zofen sie wegführen wollen, sieht sie seinen Tod vor sich und läuft davon. Die Ritter führen Gualtiero herein, er bittet um ein rasches Ende, doch bevor ihm der Wunsch erfüllt werden kann, greifen die Piraten an. Imogene und Adele kommen wieder hinzu, nur um zu sehen, wie Gualtiero und seine Leute die Brücke über den Wasserfall überqueren und die Burg verlassen. Daraufhin nimmt Gualtiero sich das Leben, Imogene verliert erneut das Bewusstsein, und die Oper endet mit einem Tableau kollektiven Entsetzens und Grauens. L’opera inizia su una spiaggia tempestosa in Sicilia, nei pressi del castello di Caldora; in lontananza si possono scorgere i ruderi di un monastero. Mentre imperversa la tempesta, i contadini e le donne si radunano per cercare di aiutare una nave in difficoltà. L’eremita Goffredo, unico residente del monastero, esorta tutti alla preghiera e poco dopo una scialuppa riesce a raggiungere la nave e a mettere in salvo l’equipaggio. Le persone rimaste sulla spiaggia si dirigono al castello per chiedere alla duchessa Imogene di ospitare i nuovi arrivati. Tra i naufraghi soccorsi si trova Gualtiero, un tempo conte di Montalto ed esiliato dalla Sicilia dieci anni prima, dopo essere stato sconfitto in battaglia da Ernesto, duca di Caldora. Nel frattempo Ernesto ha sposato Imogene, la donna amata da Gualtiero, e ha avuto un figlio da lei. Gualtiero, invece, si è messo alla testa di una banda di pirati aragonesi ed è tuttora risoluto a vendicarsi. La nave soccorsa è l’unico vascello rimasto ai pirati, sconfitti ancora una volta da Ernesto, e oggi riporta Gualtiero in quella che un tempo era la sua patria e oggi è terra nemica. Goffredo, che in tempi migliori era stato istitutore di Gualtiero, riconosce subito il suo ex allievo e i due si salutano con gioia. Ma lo stato d’animo si incupisce ben presto: Gualtiero continua a nutrire un odio profondo nei confronti di Ernesto e un amore altrettanto incrollabile per Imogene. Tornano i pescatori e annunciano il prossimo arrivo della duchessa che desidera incontrare i sopravvissuti. Desideroso di nascondere a Gualtiero l’identità della moglie di Ernesto, Goffredo gli ordina di ripararsi nella sua cella da eremita. Entra Imogene, accompagnata dalla damigella Adele, e chiede a Itulbo, compagno di Gualtiero, informazioni sul vascello naufragato. È desiderosa inoltre di avere notizie sugli ultimi avvistamenti dei pirati e soprattutto sul loro capo. Itulbo risponde in maniera evasiva, dicendo che potrebbe essere morto. Imogene, sconvolta, racconta ad Adele un sogno in cui aveva visto Gualtiero ferito su una spiaggia deserta. Proprio a questo punto esce Gualtiero e vede Imogene; la donna sente (e quasi riconosce) la sua esclamazione di sorpresa e vorrebbe sapere di più, ma viene convinta a ritornare al castello, dopo aver invitato tutti i sopravvissuti. Durante la notte, al castello, i pirati gozzovigliano. Itulbo cerca di frenarli, per evitare che rivelino la loro vera identità. Imogene incarica Adele di incontrare Gualtiero per convocarlo alla sua presenza e l’uomo entra, avvolto nel suo mantello. Lei gli offre del denaro per aiutarlo, ma lui rifiuta; entrambi ammettono di essere infelici. Solo quando la donna sta per lasciare la stanza, però, Gualtiero rivela la propria identità. I due si abbracciano, ma poi Imogene rivela di essersi sposata con Ernesto contro la propria volontà, per salvare la vita del padre prigioniero. Gualtiero inorridisce, soprattutto perché si rende conto che tutte le speranze accarezzate nei lunghi anni di esilio sono castelli in aria. La sua ira è tale che, nel momento in cui entra il figlioletto di Imogene, fa per afferrare la spada; davanti al terrore della madre, abbraccia il bambino e poi corre via. In lontananza, una banda militare annuncia l’inatteso ritorno di Ernesto dal campo di battaglia; Adele comunica a Imogene che il duca l’attende. La scena cambia: siamo davanti al castello illuminato, dove i soldati e il duca festeggiano le loro vittorie sui pirati. Ernesto è deluso nel vedere Imogene molto abbattuta. La donna dice di non stare bene e lui le promette che dedicherà più tempo a lei, ora che la minaccia degli uomini di Gualtiero si è allontanata. Le chiede notizie sui marinai scampati al naufragio e desidera che il loro capo si presenti davanti a lui. Entrano i pirati: Itulbo si fa avanti e dichiara di essere il loro capo, mentre Gualtiero rimane nascosto nel gruppo. Ernesto dichiara che tutti rimarranno prigionieri a Caldora finché non saranno stati accertati i loro nomi e le loro intenzioni, ma quando Imogene gli chiede di essere clemente, acconsente a lasciarli partire il giorno dopo. Tutti i pirati si inginocchiano davanti a Imogene in segno di ringraziamento; Gualtiero coglie l’opportunità per parlarle di nuovo, nascondendosi tra l’eremita e Itulbo per non essere visto da Ernesto, e le chiede un altro incontro. La donna fa resistenza e per tutta risposta lui chiede vendetta. Imogene sviene e, quando riprende i sensi, tutti manifestano i loro diversi pensieri e sentimenti: tormento (Imogene), preoccupazione (Adele), sospetto (Ernesto), ira (Gualtiero), e desiderio disperato di fuggire (Itulbo e l’eremita). Al termine del primo atto, Gualtiero esce, accompagnato dai suoi amici; Imogene viene portata via dalle sue damigelle. Sulla scena rimane Ernesto, immerso nei suoi pensieri, in compagnia dei suoi cavalieri. A tarda notte, davanti agli appartamenti di Imogene, gli attendenti chiedono informazioni ad Adele sulla salute della duchessa e pregano che possa trovare pace. Mentre spunta l’alba, Adele cerca di convincerla a vedere Gualtiero, che rifiuta di allontanarsi. Le due donne sono interrotte da Ernesto, che accusa la moglie di simulare un malessere mentre in realtà soffre per il suo amante del passato. Imogene ricorda a Ernesto che il suo costante amore per Gualtiero non mai è stato un mistero, e che lui ne era consapevole quando l’aveva sposata. La sua è ormai un’esistenza disperata e lei attende con ansia la fine della propria vita. Un cavaliere annuncia che Gualtiero è nelle vicinanze, e questo spinge Ernesto a desiderare con ira la morte del nemico e della moglie. Cambia la scena. In una loggia del castello, Itulbo è preoccupato: Gualtiero ha deciso di tenere tutti i suoi uomini pronti all’attacco, in base all’esito dell’incontro con Imogene. Ora che la posta in gioco è chiara, Imogene e Gualtiero si incontrano ancora una volta. Gualtiero le chiede di seguirlo; in caso contrario combatterà contro Ernesto fino all’ultimo sangue. Le prospetta i piaceri della vita sul mare, ma Imogene è irremovibile e chiede a Gualtiero di mostrare clemenza. Poi cerca di allontanarsi, ma l’uomo glielo impedisce. Contemporaneamente arriva Ernesto, che pia la conversazione, e poi si fa avanti per interrompere gli addii della coppia. I due uomini si avventano l’uno contro l’altro, assetati di sangue, poi escono per sfidarsi. Imogene si ritrova sola a invocare ancora una volta la propria morte; perde i sensi e, quando rinviene, non sa a pensare ad altro che a interrompere il duello. I cavalieri e le dame si riuniscono al pianterreno del castello, da cui si vede una cascata in lontananza. Ernesto è morto, ucciso da Gualtiero: i suoi soldati portano le sue armi e ne fanno un trofeo. Chiedono vendetta contro Gualtiero, ma rimangono stupiti nel vedere quest’ultimo entrare nel castello e offrire la propria vita in cambio della libertà per i suoi compagni. Gli uomini di Ernesto esigono una sentenza del Consiglio dei Cavalieri e Gualtiero dice ad Adele di augurarsi che la sua signora possa alla fine provare compassione per lui, prima di dirigersi verso il Consiglio. Il coro, suo malgrado, rimane colpito dal suo coraggio; Gualtiero si augura di essere ricordato per la sua vita tormentata oltre che per le sue azioni spietate. Entra Imogene con il figlio: ha perso il senno. Crede di sentire Ernesto che chiama il bambino e gli chiede di invocare la pietà del padre. Alla notizia della condanna di Gualtiero, chiede la sua liberazione. Alla vista del patibolo innalzato per lui, mentre le damigelle cercano di condurla via, immagina la sua morte, poi fugge inorridita. La scène d’ouverture se déroule alors que la tempête fait rage sur la côte sicilienne, près du château de Caldora ; un monastère en ruines se profile à l’horizon. Au plus fort de la tourmente, un groupe de pêcheurs et de femmes se rassemble pour porter secours à un bateau en détresse. L’ermite Goffredo, qui seul désormais réside au monastère, les appelle à la prière et, peu après, un canot, parvenu jusqu’au bateau, secourt l’équipage. Ceux qui sont restés sur le rivage se dirigent vers le château pour demander à la duchesse Imogene d’offrir l’hospitalité aux survivants. Les rescapés comptent parmi eux Gualtiero, l’ancien comte de Montalto, qui a été banni de Sicile dix ans auparavant après sa défaite contre Ernesto, duc de Caldora. Depuis, Ernesto a épousé la bien-aimée de Gualtiero, Imogene, qui lui a donné un fils ; durant ses années d’absence, Gualtiero a pris la tête d’une bande de pirates aragonais, bien déterminé à se venger. Le bateau secouru est le seul vaisseau dont disposent encore les pirates, après une nouvelle défaite contre Ernesto, qui oblige Gualtiero à se retrouver maintenant dans le pays de son enfance et en territoire ennemi. Goffredo, qui, en des temps plus heureux, a été le tuteur de Gualtiero, reconnaît immédiatement son ancien élève et ils se réjouissent ensemble de ces retrouvailles. Mais l’atmosphère se tend à mesure que Gualtiero proclame sa haine implacable d’Ernesto et son amour éternel pour Imogene. Les pêcheurs reviennent annoncer que la duchesse en personne va venir accueillir les survivants. Désireux de cacher à Gualtiero l’identité de l’épouse d’Ernesto, Goffredo l’invite à venir se reposer dans sa cellule d’ermite. Imogene fait alors son entrée, accompagnée de sa dame de compagnie, Adele, et interroge le compagnon de Gualtiero, Itulbo, sur les circonstances du naufrage. Elle est particulièrement curieuse de savoir s’il a rencontré récemment des pirates et de ce qui est arrivé à leur chef. Itulbo répond de manière évasive, suggérant que celui-ci est peut-être mort. Bouleversée par ce qu’elle vient d’apprendre, Imogene dit à Adele qu’elle a vu Gualtiero en rêve, blessé sur un rivage désert. À ce moment précis Gualtiero apparaît et aperçoit Imogene ; elle entend (et reconnaît à demi) son cri de surprise et voudrait comprendre, mais on la persuade de regagner le château, où tous les survivants sont invités. Le soir, les hommes de Gualtiero font ribote au château. Itulbo cherche à les calmer, afin de ne pas révéler leur identité de pirate. Imogene envoie Adele auprès de Gualtiero pour lui dire que sa maîtresse souhaite le voir ; il entre, mystérieusement enveloppé d’un manteau. Elle lui offre de l’argent, qu’il refuse ; et l’un et l’autre dénoncent la tristesse de l’existence. Au moment de se séparer, Gualtiero lui dévoile son identité. Ils s’embrassent. Imogene lui révèle alors qu’elle a épousé Ernesto, forcée et contrainte pour sauver son père de la prison et de la mort. Gualtiero en est attérré, d’autant plus qu’il voit s’effondrer tous les espoirs qu’il a bâtis durant ses années d’exil. Il en conçoit une telle fureur qu’il porte la main à son poignard à la vue du jeune fils d’Imogene ; au cri de sa mère, il se ressaisit et embrasse l’enfant avant de quitter précipitamment la scène. Une musique militaire annonce le retour inattendu d’Ernesto, après la bataille ; Adele informe Imogene que le duc attend sa visite. La scène suivante se déroule dans la cour illuminée du château, où le duc et ses soldats célèbrent leur victoire sur les pirates. Ernesto est déçu de voir Imogene si abattue. Elle se dit souffrante et il lui promet de s’occuper davantage d’elle maintenant que la menace des hommes de Gualtiero est écartée. Ernesto lui demande ce qu’elle sait des marins naufragés et demande à voir leur chef. Les pirates se présentent et Itulbo se déclare leur chef à la place de Gualtiero, resté caché parmi l’équipage. Ernesto commence par déclarer qu’il les gardera prisonniers à Caldora en attendant de connaître leur identité et leurs intentions. Imogene fait alors appel à sa clémence et Ernesto accepte de les laisser repartir le lendemain. Les pirates s’agenouillent devant Imogene pour la remercier et Gualtiero, caché de la vue d’Ernesto par l’ermite et Itulbo, en profite pour lui parler à nouveau et lui demander un rendez-vous. Quand elle refuse, il la menace de sa vengeance. Imogene s’évanouit. Tandis qu’elle reprend ses esprits, les autres personnages révèlent leurs pensées et leurs sentiments : Imogene est au supplice, Adele inquiète, Ernesto gagné par le soupçon, Gualtiero furieux, et Itulbo et l’ermite impatients de fuir. Pour finir, Gualtiero est entraîné par ses amis d’un côté et Imogene par ses dames de compagnie de l’autre, tandis qu’Ernesto, perdu dans ses pensées, reste seul sur scène en compagnie de ses chevaliers. Tard dans la nuit, dans l’antichambre des appartements d’Imogene, l’entourage de la duchesse s’enquiert de sa santé auprès d’Adele et prie pour son repos. À l’aube, Adele tente de convaincre Imogene de rencontrer Gualtiero, qui ne repartira pas sans l’avoir revue. Leur conversation est interrompue par Ernesto, qui accuse sa femme de feindre la maladie alors qu’elle se languit de son ancien amant. Imogene rappelle à Ernesto qu’il connaissait ses sentiments pour Gualtiero quand il l’a épousée, et que ceux-ci n’ont pas changé ; elle vit néanmoins sans espoir et attend la mort avec impatience. Un chevalier vient signaler à Ernesto la présence de Gualtiero au château. À ces nouvelles, le duc éclate de fureur et veut la mort de son ennemi comme de sa femme. La scène suivante se déroule dans une loggia, au château. Itulbo est troublé par les plans de Gualtiero qui veut garder tous ses hommes en place prêt à l’action, en attendant le résultat de sa rencontre avec Imogene. Les enjeux sont désormais clairs : soit Imogene accepte de le suivre, soit il affronte Ernesto dans un duel à mort. Durant leur rencontre, Gualtiero s’efforce de tenter la duchesse en lui décrivant les plaisirs de la vie en mer, mais celle-ci reste ferme et le supplie de faire preuve de miséricorde. Lorsqu’elle tente de partir, il l’en empêche. Ernesto, qui a épié leur conversation, sort de sa cachette pour interrompre leurs adieux. Assoiffés de sang, les deux hommes s’affrontent et partent se battre. Imogene, restée seule, en appelle à sa propre mort avant de s’évanouir ; lorsqu’elle reprend conscience, elle ne songe plus qu’à arrêter le duel. Les chevaliers du château et leurs dames sont réunis dans une salle du château qui a vue sur une cascade à l’extérieur. Gualtiero a tué Ernesto. Les soldats du duc ramènent ses armes en trophée et jurent de venger sa mort. À leur stupéfaction, Gualtiero vient se livrer à eux en échange de la liberté de ses hommes. Les soldats demandent qu’il soit jugé par le Conseil des chevaliers ; Gualtiero prie Adele de dire à la duchesse qu’il aspire à sa compassion. Alors qu’il est emmené vers le Conseil, le chœur admire son courage, malgré son crime ; Gualtiero espère qu’on se souviendra de lui en raison des souffrances qu’il a endurées et non de sa cruauté. Imogene apparaît accompagnée de son fils. Elle a perdu la raison : elle croit entendre Ernesto appeler leur enfant et demande à celui-ci d’implorer la pitié de son père. À l’annonce de la condamnation de Gualtiero, elle demande en vain sa libération. Elle assiste à la construction de l’échafaud et, tandis que sa suite tente de l’éloigner, imagine l’exécution de Gualtiero avant de s’enfuir, prise d’horreur. Les chevaliers amènent Gualtiero, qui leur demande de faire vite, mais l’exécution n’a pas lieu car les pirates attaquent. Imogene et Adele réapparaissent à temps pour voir Gualtiero et ses hommes quitter le château par le pont qui surplombe la cascade. Une fois le pont franchi, Gualtiero se donne la mort ; Imogene s’évanouit à nouveau et l’opéra s’achève une scène de consternation et d’horreur collectives.